Modern Dentistry Leads to Brighter Smiles! At Fulshear Dental, we’re always excited about the latest developments in the oral healthcare field. New techniques and technologies improve our patients’ experiences in so many ways, from added comfort to top-tier precision to smooth, stress-free efficiency. If you’d like to learn more about the advanced tools we use, keep reading below or contact us today in Fulshear, TX! Dr. Fifadara can’t wait to meet you and your family. 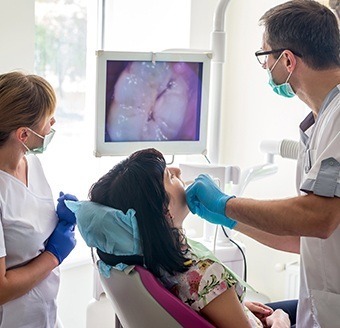 If you’ve ever wondered what exactly your dentist is seeing as they peer inside your mouth during an examination, our modern intraoral camera can shed plenty of light on the topic. The process is simple – our team will expertly navigate a camera-tipped wand through the mouth, capturing plenty of high-resolution images of the teeth, gums, and existing restorative work. These images can later be displayed on a monitor in the treatment operatory, allowing Dr. Fifadara to more clearly point out potential problems and explain the positive benefits of certain treatment options. Digital radiography has become the superior diagnostic option compared to traditional film, and it’s certainly not hard to understand why. While older X-rays required hours of darkroom development to view, this modern technology simplifies the process down to mere seconds. Our patients are exposed to much less radiation as well – up to 90% less when compared to the original machinery, in fact – which makes it safer for children and adults alike. 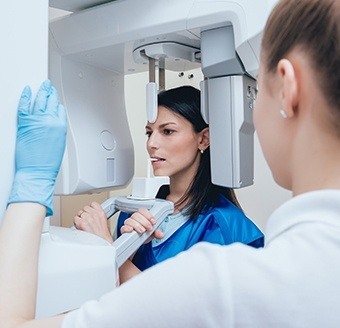 While digital X-rays are an enormously valuable way for our team to see underneath the surface of each patient’s smile, their scope can be limited when planning particularly advanced treatments. That’s where the revolutionary Cone Beam comes in! This technology creates comprehensive, three-dimensional models of the patient’s oral structures, outlining even the smallest details like sinuses and facial nerves with precise clarity. Dr. Fifadara often relies on these scans when performing surgical dental implant placement, tooth extractions, and root canal therapy. 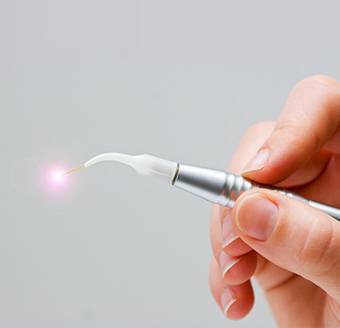 When treating the soft gum tissue, a delicate touch is important to Dr. Fifadara. That’s why she’s chosen to invest in a state-of-the-art soft tissue laser for periodontal therapy, aesthetic gum recontouring, and other similar services here in Fulshear! The laser’s precise beam can treat bacterial infection and even eliminate infected tissue in a very conservative fashion, providing instant sterilization that minimizes bleeding and swelling. Patients can expect to feel much more comfortable while they’re in the treatment chair and recover at a quicker rate to boot. If you’re regularly struggling with noticeable jaw/facial pain and/or lingering headaches, the temporomandibular joint may be to blame. This small body part (also known as the TMJ) has a very big responsibility, connecting the jawbone to the skull and helping you speak and eat. 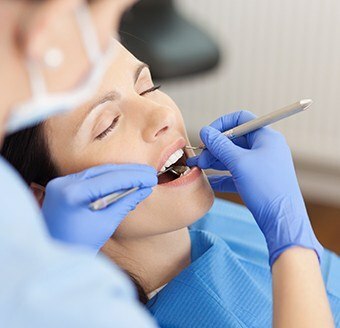 When dysfunction occurs, patients can end up struggling with serious and even debilitating health problems as a result – thankfully, the Fulshear Dental team can lend a helping hand! We offer dedicated TMJ therapy, including occlusal adjustment, custom-made occlusal splints, and even treatment with a TENS machine. Have you recently been diagnosed with mild to moderate Obstructive Sleep Apnea (OSA)? Or maybe you’ve lived with the condition for years but have struggled to find long-term relief with the CPAP machine. Whatever the circumstances are, a trained dentist like Dr. Fifadara may be able to help you rest easier at night with custom oral appliance therapy! This device is designed to comfortably reposition the jaw and/or tongue so that airway blockage (the core cause of OSA) doesn’t occur in the first place, which means you can finally wake up feeling invigorated and ready for the day ahead. If you regularly suffer from feelings of mild to moderate anxiety and fear when confronted with an upcoming visit at the dentist’s office, rest assured that you’re not alone. At Fulshear Dental, helping patients feel comfortable throughout the care they need and deserve is important to us – that’s why we offer sedation dentistry in the treatment chair. Nitrous oxide (“laughing gas”) and oral conscious sedation can both go a long way towards soothing nerves and creating a genuinely relaxing environment throughout even the most extensive procedures.